B. Thomas (Arlington, Texas, United States) on 24 June 2017 in Animal & Insect. 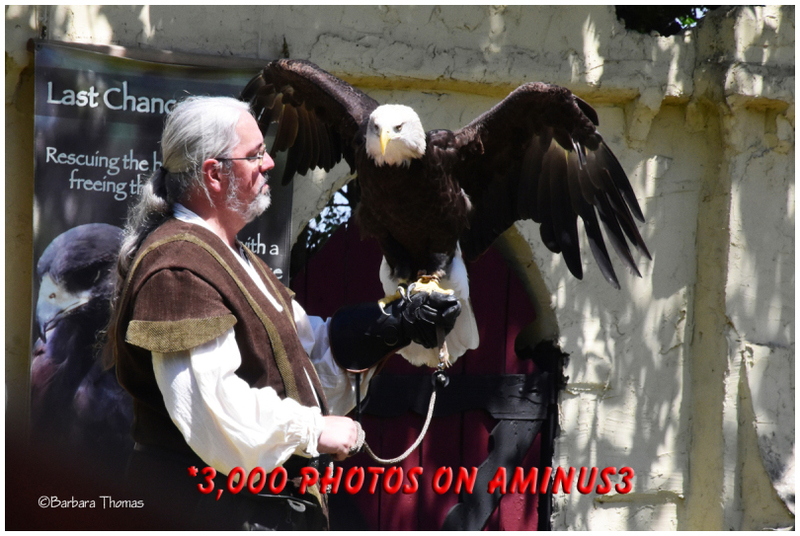 Presented by Last Chance Forever Birds of Prey Conservancy – The Birds of Prey Show at Scarborough Renaissance Festival is an interactive exhibition that incorporates flying and non-flying raptors. Knowledge of basic raptor biology and natural behaviors, insights into the plight of the natural world and the human effects in the balance of living things is shared in a conservation-themed entertainment program. This bald eagle and some of the other birds are too injured to be set free so they are used to educate the public about birds of prey and how to protect and save them. The quality of light in this shot is not good but it was very hot, and they wanted to keep the birds in the shade. We are not sufficiently aware of the importance of protecting all species. This a serious problem. Thank you that there are people dedicated to this. A great look at this fine bird. Congratulations on reaching 3,000. Wow, that's great persistence and dedication. This looks like it was a worthwhile visit too. and a wonderful shot too! @Devi: Sorry, but I'm pretty sure it's not going to happen. It has been a year now, and his mate is coming with another male. They mate for life, and it took her all this time to find a new mate, so we feel like we just have to accept that Nacho was a wonderful and special gift but time has passed and we just have to enjoy the other foxes. Thanks, though. We miss his too! A magnificent view of this bald eagle! Beautifully photographed! Toutes mes félicitaitons quelle belle galerie et ce rapace sueprbe. I too miss Nacho B...But I am happy she keeps coming back..
May be he has relocated ? Great photo to commemorate this milestone! !